Cats and other vertebrate animals yawn. Cats can even catch yawns from people. People yawn from before they are born until old age. We yawn when we’re tired. We yawn when we’re bored. We yawn when we see other people or our pets do it. Other vertebrate animals do it too, including cats, dogs, fish, birds, and snakes. Science hasn’t completely nailed down an explanation for why we yawn, but we understand the factors that cause yawning and have theories about contagious yawns. First, it’s worth knowing the medical term for yawning. Actually, there are two words. Oscitation is the term for opening the mouth. Pandiculation refers to the act of yawning and stretching. The average yawn lasts 6 to 8 seconds. Yawning may occur in unborn babies, but contagious yawning doesn’t start until a child is about 4 years old. You can fake a yawn (and even fool others into contagious yawning), but natural yawns are an involuntary reflex. A yawn is much more than just opening your mouth (oscitation). During a yawn, the tensor tympani muscle in the middle ear contracts, producing the rolling sound within the head. In people and other animals, yawning is generally accompanied by stretching other parts of the body besides the mouth. Stretching the jaw increases heart rate and blood flow to the head, neck, and face, while deep breathing forces down blood and spinal fluid from the head. 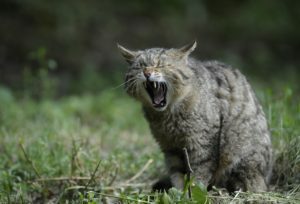 Results of a 2007 study by Andrew Gallup at the University of Albany indicate yawning cools the brain, which may make it a method of thermoregulation in vertebrates. A study in parakeets found birds yawned more as temperature increased, while a study in humans found people are more likely to yawn in cold weather than in hot weather. While seemingly contradictory, the results could mean the birds use yawning to try to cool their brains and humans yawn more when the temperature is low enough to have a chilling effect. While temperature change is associated with yawning, it’s not the only stimulus. Sleepiness, stress, and boredom are associated with yawning. Anecdotal reports indicate yawning can help increase alertness, helping to fight off fatigue or increase performance when a person is nervous or stressed. Yawning often accompanies any change in the state of the body that affects neurotransmitters. Increased yawning is associated with an increase or decrease in serotonin, nitric oxide, dopamine, or glutamic acid. An increase in levels of endorphins and other opioid neurotransmitters, on the other hand, is associated with decreased yawning. The commonly held belief that yawning increases tissue oxygenation actually hasn’t stood up to research. Studies in humans have shown yawning can reduce oxygen intake and that either increasing oxygen or decreasing carbon dioxide in air does not decrease yawning. However, other animals do yawn to increase oxygenation. For example, some fish yawn to intake more oxygen. Yawning also seems to be a method of nonverbal communication or an expression of herd instinct. Some species of penguins yawn at each other as part of their courtship ritual. Siamese fighting fish yawn at their reflections or other fighting fish as a show of aggression. People and their pets catch yawns from each other. However, in people, only about 60-70% catch yawns. Older people, young animals and people, and persons with autism and schizophrenia are less likely to catch yawns. People are more likely to catch yawns from friends and family members than from strangers. Psychologists believe this has to do with empathy. Multiple studies have connected increased empathy with increased contagious yawning. Young children and animals have not yet developed the skill, while older people may be less affected by the actions of others. Gallup, Andrew C.; Gallup (2007). “Yawning as a brain cooling mechanism: Nasal breathing and forehead cooling diminish the incidence of contagious yawning”. Evolutionary Psychology. 5 (1): 92–101. Shepherd, Alex J.; Senju, Atsushi; Joly-Mascheroni, Ramiro M. (2008). “Dogs catch human yawns”. Biology Letters. 4 (5): 446–8.